Let me just start off by saying this recipe is approved by my husband which is a very good sign. Sometimes it takes him a little to get used to new things that I introduce him to(he is your typical “meat and potatoes” guy(two things I rarely cook). So when he tried this and immediately loved it, I was very excited! Year round tea is my main beverage(after water), during the summer I prefer to drink iced tea. 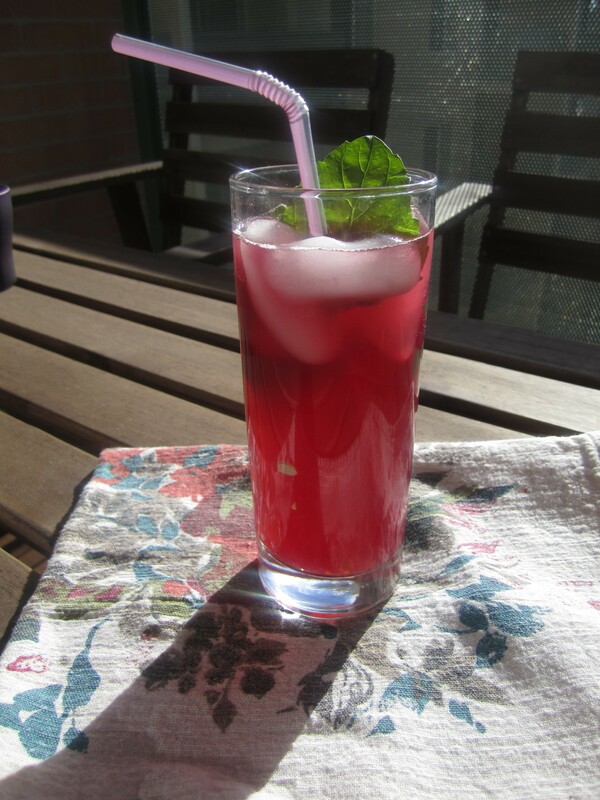 I made a huge batch of iced tea with Blueberry Bliss Rooibos Tea by Tevana. When I buy teas I like to stick to a loose leaf tea, and I try to buy from a local tea store, but I just moved to a new city and am not familiar with the tea shops, so Tevana it is. You could use any flavor tea for this, pineapple, strawberry, peach, mango, raspberry, or any type of fruit based tea you enjoy, I supposed you could also you a plain black tea if fruit teas aren’t your thing. Like I’ve said before, the best thing about you making it is you get to make it exactly how you like it!!! I garnished it with a little mint leaves just enough for my last couple of sips to get the hint of mint. If you cannot find Meyer lemons use regular lemons but I strongly suggest you look for Meyer lemons, they are sweeter and less acidic than regular lemons Meyer lemons really make this drink. I forgot to mention the best part it is calorie free(when using Stevia as a sweeter)!!! 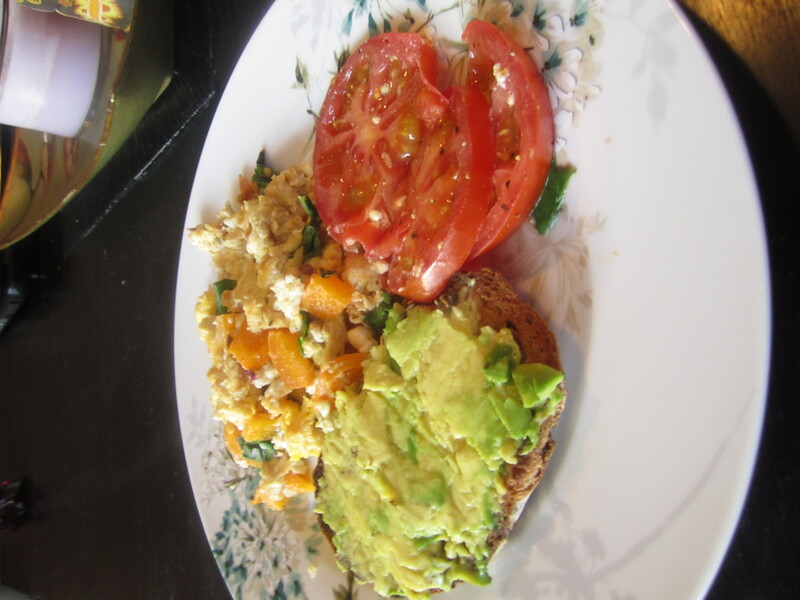 I made a veggie scramble(bell pepper, and onion), had a piece of toast(I use sprouted grain), spread some avocado on it(if you have never had avocado try it immediately, I started doing it in Tanzania because we didn’t have butter very often, and became addicted). Another thing that I picked up from another country was tomatoes as a side for breakfast. While I was traveling in Italy a lot of places had tomato slices along with cuts of cheese, breads, hard boiled eggs, and of course some sweets. Not your typical American breakfast but it really caused me to venture out a little while eating breakfast. I love, love, LOVE, tomato but had never thought to add slices as a side for breakfast until I saw it in Italy. Now I do it all the time, and even request tomato slices instead of hash browns when going out to breakfast. At least once a week I make a vegetarian dinner. I usually do it on Monday’s(Meatless Mondays), but this week my husband was gone a night for work, and I’m a girl who is totally satisfied with a plate of veggies and grains so I make this light and refreshing dish. After eating I felt satisfied, but I didn’t have that overly stuffed feeling like I couldn’t do anything else for the night. 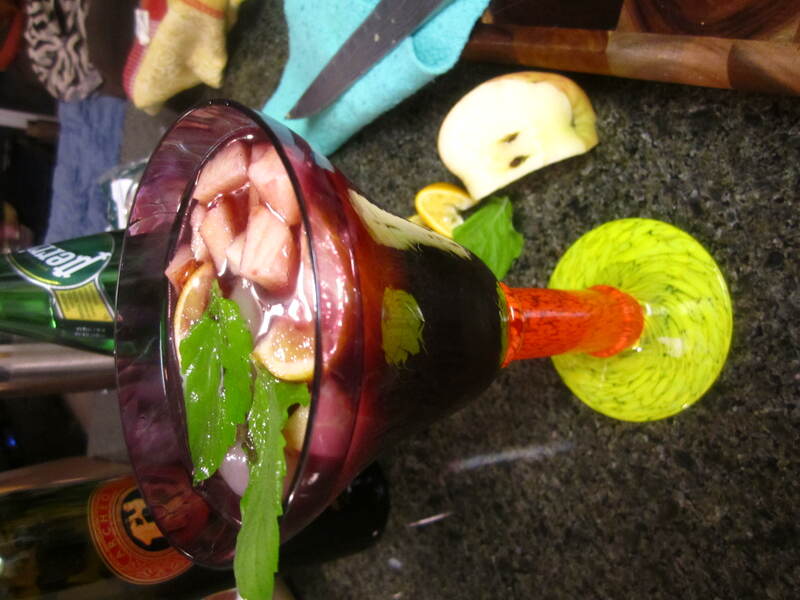 In fact I felt so great I felt inspired to make some Red Wine Sangria! 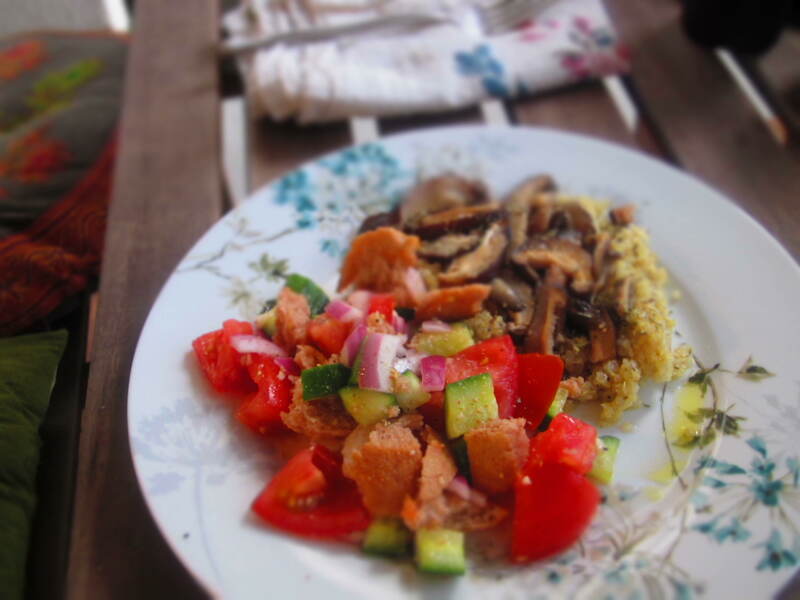 Here I had a tradition Italian Panzanella Salad, if you haven’t had that salad before it is a must try, especially during warmer, summer months. I had some shitake mushrooms and served those over quiona. Very simple, light, and satisfying. Let me just tell you that I am a huge fan of eggs in the morning. Five out of seven of my mornings are started with the incredible edible egg 🙂 Within an hour of waking up it is important to consume protein. I aim for about 20 grams in the morning, two eggs has about 12 grams of protein, then I usually had a little all natural non flavored protein power(I just sprinkle it on after I’m cooking my eggs, you can’t even taste it), add yogurt, or a nut butter or cheese depending on what I’m cooking that day and I am good to go! This particular meal was just a creation of what I had at home. 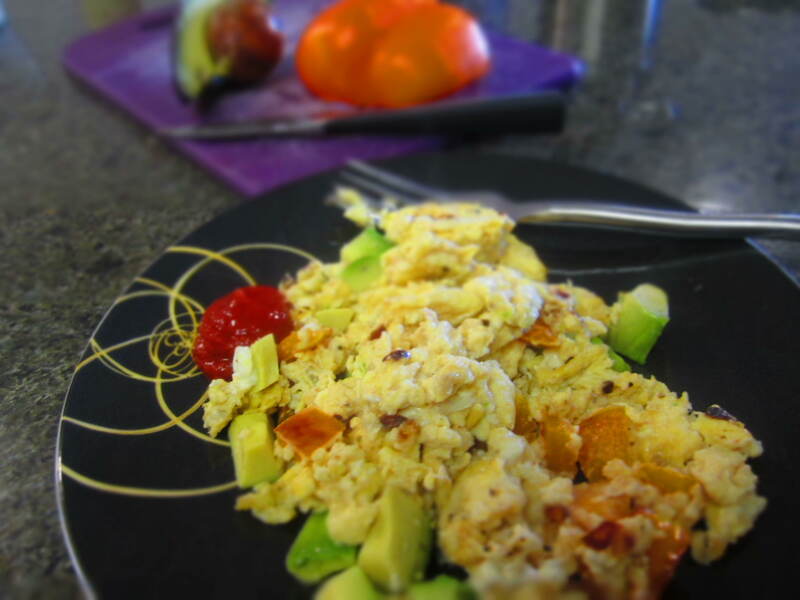 I almost always have avocados, eggs, and veggies so I put them all together and added a little feta, sprinkled a little Psyllium husks on top(to get some fiber) and I was all set! Mix it all into a glass of your choice and enjoy!!! Cheers! A quick note about Stevia. Some stevia can taste very bitter, and have an almost medicinal taste. I wasn’t hooked on Stevia until I found NuNaturals . A little goes a long way, so when using it start off with a little you can always add more! NuNaturals can be found at Whole Foods, Amazon.com, iherb.com, and various other places. Defiantly worth the buy!